An accumulation of radioactive gases in the reactor vessel led to some venting of radioactive materials as well as concern that the danger of an explosion might dictate a general evacuation. Eventually Governor Thornburgh did issue an advisory that those within a ten mile radius of the plant should stay inside and pregnant women and children within a five mile radius should evacuate. That evening the lead story on CBS was Walter Cronkite’s report on Three Mile Island. Widely trusted by the American public, his words – “we are faced with the remote but very real possibility of a nuclear meltdown at Three Mile Island atomic power plant”- focused worldwide attention on central Pennsylvania. Over the next few days as many as 140,000 central Pennsylvania residents voluntarily evacuated, mainly in response to apparent uncertainty and lack of consistency in the messages from various authorities. For a full explanation of the “bubble” scare visit the PBS website. 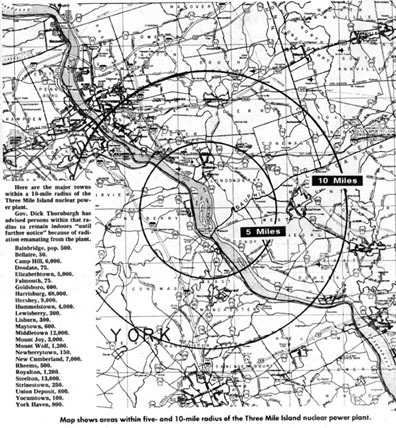 At the request of Governor Thornburgh, President Jimmy Carter sent the NRC’s director of reactor regulation, Harold Denton, to Three Mile Island to coordinate efforts to control the plant as well as communications with relevant agencies and the public. At the 10 o’clock press conference that evening, his expertise and calming presence reassured area officials and residents alike. Thereafter he brought much needed coordination and expertise to all aspects of the emergency. Many central Pennsylvania residents would later voice strong appreciation for Mr. Denton’s work.